Each dairy has unique needs. As a small, family-owned business, Turner can understand the unique needs of each customer and provide custom solutions. The innovative design of Turner Parlor Stalls allows them to be installed in tight spaces where most other stalls would not fit. In fact, Turner Parlor Stalls have been installed in barns with as little as 7 feet of ceiling height. Custom milking barns and low-profile parallel stalls are a quick fix with Turner Parlor Stalls. 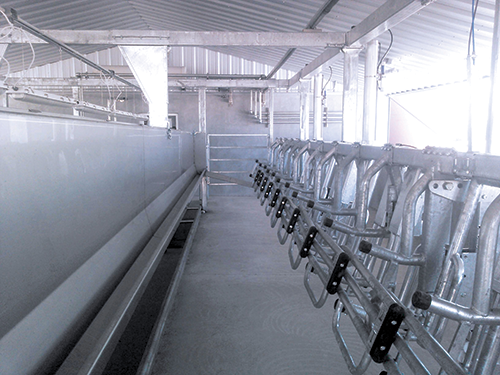 Whether using ceiling troughs, low-profile stalls, drop rails, or cable lifts, we’ve got the answer to your parlor problem. With just a few measurements, the design team at Turner can create a solution for nearly any situation.